This dosa comes out spongy and the aroma from the curry leaves and the small onion tempts our taste palettes. Soak the flattened rice separately. Soak the rest of the rice,seed and dal ingredients together for about 2 to 3 hours. Drain and grind the mixture to a smooth paste using water as required to a batter consistency. Grind the onion, curry leaves and the green chillies together and add to the above batter. Allow it to ferment for 5 to 6 hours. Pour a ladleful of the batter on it and spread it in a circular motion to make thick circle. Smear a little gingelly oil along the edges. Cover the dosa with a lid and cook on a medium flame. The steam cooks the top layer. 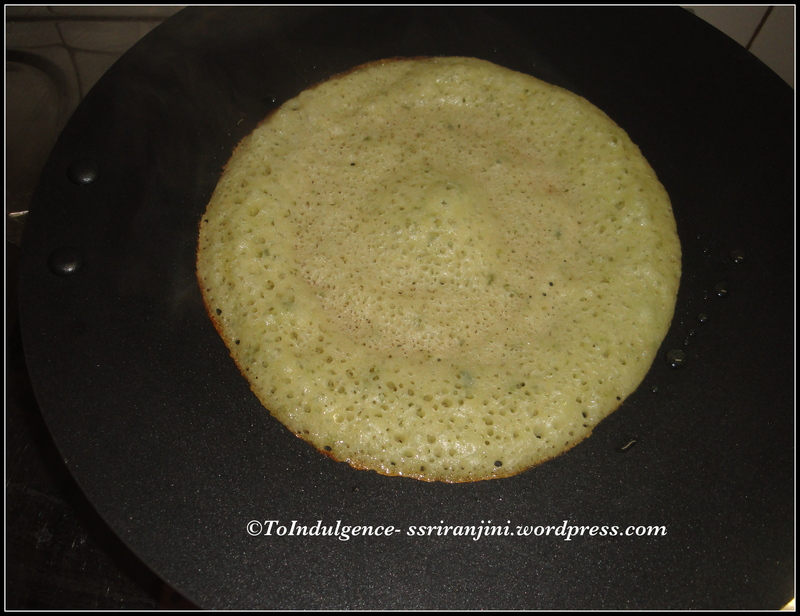 Do not flip the dosa as the top portion of the dosa is cooked on covering. Serve immediately when the dosa is crisp at the bottom and spongy on top with Garlic Chutney or Sambar.